James and Oliver Phelps Christen New YouTube Channel With Audiocast From the Madrid ‘Harry Potter: The Exhibition’ Opening! Actor Interviews, Events, Fan Events, Fandom, Fans, Fun, Harry Potter:The Exhbition, HP Cast, Interviews, J.K. Rowling, Media, News, Phelps, Props-Sets, Warner Bros. 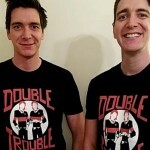 The Weasley twins have expanded their reach beyond Diagon Alley and are now hosting an audiocast on their new YouTube channel “Double Trouble”–aptly named. James and Oliver Phelps spoke to fans from Madrid, Spain, where they attended the latest opening of Harry Potter: The Exhibition. Oliver Phelps announced the move on twitter, inviting fans to “enjoy!” (and, presumably, subscribe). They kicked off the audiocast from the Quidditch area of the exhibit just before taking the stage for the official opening, where they gushed over the warm and welcoming reception they had received in the Madrid. Over another deafening roar, they replied, “These guys!” They went on to say that what they love about the exhibition is that “you’re really fully inside the world,” which is surely a dream come true for many devoted fans. They wrapped up their time on stage with some wand play and spell instruction–complete with cannon and confetti explosion–to the delight of all the fans! They turned the tables and asked Newquist how GES chooses which props come on tour. He observed that when GES first partnered with Warner Bros., the movies were still filming. Still, they knew it was important to select the memorabilia that would have the greatest emotional connection. Some were easy to identify–Harry’s wand, robes, and magical objects from Weasley’s Wizard Wheezes. James and Oliver also noted that there is always a good turnout, and Newquist commented that over the course of the exhibition’s travels, it has played host to an amazing 4-5 million fans! And to confirm what we already knew (that this is the best fandom ever), he added that while each locale is different, the reception is always the same. Since the fans are so awesome and care so much about the wizarding world created by J.K. Rowling, GES has taken great pains to produce the best experience possible. Newquist mused, “We knew that fans wanted to interact with the world and not just see things in cases.” Hence the many open displays and the setup that allows fans to feel like they’re in the rooms and halls of Hogwarts. Phelps appreciated that all props are given hallowed status within the exhibit–no prop is more important than another. Whether it’s the golden egg or the Marauder’s Map, there is no one “pivotal” piece, which is a wonderful aspect of the displays, since fans strongly relate to different parts of the series and can enjoy the well known to the obscure equally! Knowing that all parts of the exhibition are precious (stray LOTR reference there) puts great responsibility on GES to take meticulous care of the props. Newquist acknowledged that the film artifacts are Hollywood history, and so they treat them as such. Taking that into consideration, the twins wondered if packing for the move was a particularly worrisome ordeal. Newquist was confident that they had everything well under control, though he admitted he’s always aware that surprises happen, so they give everything “the white glove treatment.” He also mentioned that their relationship with Warner Bros. is so good, they collaborate on how to prevent and treat wear and tear on the props and costumes as soon as it comes to light. The Phelps closed out their interview with Newquist by asking him about other exhibitions he’s put on and, by extension, how they compare to Potter. 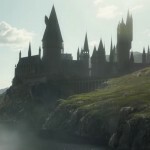 Newquist said that what makes the world of Harry Potter so unique is that it has unmatched “generational appeal.” From children to grandparents, love for the series continues to be passed on–and keeps growing! After ending that portion of the audiocast, the Phelps brothers chatted about their week in Madrid, backed by photos from around the city. The highlight of their sightseeing included a visit to the new Madrid Darby stadium for a football match between Real Madrid and Athlético. Even with the atmosphere of the game being “very memorable,” they identified their standout memory as the opening of the exhibition itself–coming full circle with the audiocast. They likened the excitement to the Potter premieres and noted, again, how warm and welcoming the fans had been. In the final minutes of the audiocast the twins discussed their plan to post a few shorter segments and at least one longer audiocast weekly. As for potential topics, one brother suggested pranks. (No surprise there–they are “double trouble,” after all!) The other opened the question up to the fans, saying that ideas for future audiocasts are welcome. Fans can leave comments on the Limor app, currently available on IoS and, hopefully, on Android early next year! This should be a great way for the Phelps twins to connect with their fans regularly, and their YouTube channel will no doubt gain a following. This recap does not do their humor and warmth justice, so have a listen at the link included in the tweet and access that app to give them your thoughts. We can’t wait for upcoming posts! Whilst Oliver and I were in Madrid we did the first of our new #DoubleTrouble #socialAudio #podcast . We hope this to become weekly thing of fun talks etc. If you have any ideas on how we can make it to what everyone wants to hear please let us know. #limor #socialaudio ?? https://t.co/1OmQL9lCl2 https://t.co/jM9l5GQIrP https://www.youtube.com/channel/UCZRLDuaN8O4q6JX-qx_UKZQ ????? ?